History can turn off some kids faster than you can say, “Time to pick up your room.” Chalk it up to living in a fast-paced world where instant gratification is the norm…kids just don’t get that jazzed about stuff that’s happened long ago, let alone 5 minutes from now. PBS Kids must have had this in mind when it recently launched its new Web series, Wilson & Ditch: Digging America. It’s an activities-packed online destination that aims to make American history, geography and culture a little more…well, lively. 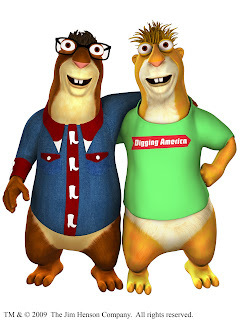 The series stars two fun-loving gophers who road-trip across country and learn quite a bit along the way. My 5-year-old and I checked it out and, considering our limited real-world traveling experience, had quite an adventure. Games like Road Quest take license plat spotting to a new virtual level, while Picture Yourself let us drop our own digital photos into various backdrops. (Now, Peyton can feel like she’s been to the desert, minus the dry heat!) There are also downloadable activities, podcasts and travel journals that will undoubtedly inspire wanderlust. In a Nutshell: History, boring? We’d never utter those two words in the same sentence. Plus, we have a new list of places we’d like to visit that don’t require a passport.